May 31st, 2014 What Does It Take? So what is it? When do we reach a point where we stop the slide? It's different for each of us, for sure, but there are similarities--things universal to the struggle. I reached a point where I was gradually losing everything but weight. My sleep was so messed up. I was always exhausted and this contributed to losing my ability and desire to care about myself. My weight gain was bringing back health issues I thought I'd experienced the last of, like high blood pressure and severe swelling in my right leg. And I was quickly running out of clothes to wear. My recovery actually started long before the current state of this journey. It was January of this year when I finally came to the conclusion that if I didn't get help for my severe sleep issues, I might not ever be able to correct and recover. Even after two sleep labs and the installation of a new cpap therapy, the struggle continued. This time it was in ways worse than the all out slide. I was sliding and then getting on track, then sliding again--then getting on track again--and over and over...and over. "I've been trying to identify and best articulate the most critical element transforming extreme struggle into harmonious consistency. Having experienced both, it's a fascinating study. Sure, it's a combination of elements, but what is the one, that without, all the others become ineffective? Is it acceptance, where suddenly we embrace instead of reject? That's fine, but how do we get to a place of acceptance? I keep coming back to perspective. Dr. Wayne Dyer says it so perfectly: “When you change the way you look at things, things change.” The perspective we choose is paramount to our success, of course. Sometimes, finding the perspective that engages the gear you're looking for isn't as easy as someone saying, “change your perspective.” In my opinion, we first must identify, one by one—the mind noise and clutter that keeps our perspective in a locked position. It's mental work that's worth the effort. Because if we can get past these things and truly shift our perspective, suddenly what once seemed impossible becomes not only possible, it becomes our new everyday reality, a non-physical transformation where we can finally experience the seemingly elusive, harmonious consistency." "Want. Want is first. If we don't want to change, nothing happens. Belief is second. If we don't believe we can change, nothing happens. Self awareness comes third. If we don't become aware of the inner self, the baggage of the past, the self conscious "facts" we already have in place that are working to defeat us and keep us locked into our old behavior, they will, eventually and assuredly derail any attempt to change and again, nothing happens. Change, you see is a process and there is ALWAYS a most important element. We move from one most important to the next, and sometimes we must move back to the previous most important element, which brings me to one more "most important" element: Faith. If we don't have faith, we are sure to fail. Faith that I CAN change. Faith that the mistake I just made doesn't doom me. Faith that if I get on track, or get back on track, change will come. If we lose faith, none of the other elements will matter, because we won't believe they can work. We, of course could debate the order of these elements or which is the MOST important, but after years of struggle, growth, setbacks and triumphs, I believe that is a pretty good BASE list of the "most critical elements" of transformation. Oh, and let me add one more, lest I forget it and lose all of my progress: HUMILITY. If I ever think "I've got this figured out" I will surely fail. I must remain teachable, and the first element of being teachable is a realization that I do NOT already know all that I need to know. So the list I have shared with you here is Want, Belief, Self Awareness, Faith, Humility. Odd that I should have almost forgotten humility, and then placed it last on the list. As I sit here typing, the thought occurs to me that perhaps HUMILITY should be FIRST. Perhaps that I almost didn't even think of it is the real root of my problem? Without humility NONE of the other elements could exist. I guess I don't know which is first. All I know is there are a LOT of elements to change and they are ALL the most critical. Thank you Sean for starting my day off with a good think. Now I will add a prayer to it, and I should be off to a good start." When a point of complete and utter desperation is reached, the proverbial "rock bottom," and it's enough to get our attention--and we sincerely want out and to find our way back...then we surrender. When I emailed Dr. Marty Lerner at Milestones in Recovery in Florida to inquire about the cost of a 30 day stay, my long and drawn out surrender was starting. When the cost prohibited me from remotely entertaining the option, I had to figure out something else and fast. But there I go again--thinking I could do it on my own, alone--and maybe then I can lose the weight I've gained and nobody outside of the people around me everyday will be the wiser. I've "surrendered" before, where I threw my hands up and declared I was powerless over this and needed help. I even wrote a blog post titled "surrender," a long while back. The post included a prayer for recovery and it was powerful to me. I forgot about how I was supposed to help myself, for best results. So what happened? Relapse happened. But why?? Because I stopped doing the things that were working for me. If you're rowing your boat across a large body of water and suddenly you stop rowing, what happens? You come to a stop, occasionally moving with the flow of the currents, you're at the mercy of the currents. If you stay there long enough , you risk encountering things that could sink your boat. Then, as the buoyancy of the boat is compromised we cry out...why is this happening??? We stopped rowing. We stopped doing what was moving us forward, what was keeping us ahead of the storms. My greatest struggles came after I disconnected from any semblance of spirituality within my journey, I stopped writing on a regular schedule, I stopped using my Calorie Bank, I stopped reaching out for support, I stopped reading what others were writing, I stopped relating to others, I stopped exercising, I stopped recognizing that emotional eating is supported by the lie that food has magical powers to fix things, I stopped taking care of myself, I stopped everything. I stopped rowing my boat. Suddenly when the storms came, I had nothing to fall back on--I had sacrificed it all. I had isolated myself in the middle of nowhere nice. But still--the question...WHY??? The answer?? Because my pride and lack of humility kept me from accepting personal truths about my food addiction. I wanted to be normal, damn it. I just wanted to be a different type of person--you know, the kind who doesn't have food issues and is an intuitive eater and loves to exercise regularly--and maintaining a healthy weight is just something that comes natural...I wanted to be that person. Anything but me. Why?? Because I didn't like me. Because no matter what I did, I found a way to consider myself a failure. I filled my head with so many self-abusive thoughts that were untrue--I started believing them. The more weight I'd regain the more disdain I had for myself. The daily mental beat downs kept me feeling defeated. I constantly put myself in a down position. And eventually I lost the strength and will to get back up. That is, until I accepted a change in perspective. I let go of the struggle and basically said--tell me what to do!! Whatever it is I need to do, I'll do it. 100% of the people I've talked to who have enjoyed years and years (one with almost three decades) of uninterrupted maintenance never stopped rowing their boat. They understood, for people like us, it's something we must do for the rest of our lives. We must always be aware. Always measure and weigh our food, always take extraordinary care by maintaining an exercise schedule. Always navigate restaurants with a keen awareness of what we're ordering and doing. We must always seek support with like minded people. We must always stay connected. And another thing I've noticed about people who do what's needed for recovery--they don't eat sugar. Some even avoid wheat and flour. And they're okay with it all. In fact, they're living fuller and richer lives because of their efforts. I've reached a point of acceptance and it feels so incredibly good. I'm worth the effort. I'm going to make it. So are you. Today was another wonderful day. I took time in preparing and enjoying my food. I had an incredible workout at the YMCA and I'm looking forward to my next weigh day on June 11th. I'm feeling smaller. My clothes are loose and people are once again starting to notice the positive changes. The incredibly long nap last night kept me awake until after 2am. At 4:30am I was back up getting ready for work. Lucky for me, I was able to split the day and come home for a much needed nap before going back to finish the day. I needed it. I was very efficient upon leaving the studio. I ran a couple of errands and then it was straight to the YMCA for a date with the elliptical. After an incredibly intense workout, I enjoyed Hawaiian Fajitas at a little Mexican restaurant not far from the Y and now I'm poised to go to bed relatively early on a Friday night! The restaurant meal was planned and I was on target with exactly what I wanted and didn't want. I had a fairly good sized breakfast and lunch today, so the plan was to keep dinner under 500 calories and leave some room in the Calorie Bank for some fruit while writing this post. I avoided the chips, no guacamole (mine is better) and no beans and rice. I asked for corn tortillas instead of the usual flour they serve. With a small amount of steak, chicken, pineapple and shrimp in each one and a tiny smear of sour cream on each it was mission accomplished. And it was delicious. I browsed the older tweets on my food and exercise Twitter feed before this planned dinner out in order to determine how long it had been without a restaurant meal. Twelve days. The last meal out was on the 18th with mom in Stillwater. After much thought and consideration, I believe this is a personal lifetime record! Twelve days without some kind of meal out?? That's not like me at all. But I like it. I like it a lot. I've given much thought to this dramatic change in me. Struggle has been replaced with peace and calm. Confusion and frustration has been replaced by a degree of clarity I've never known. And this has me thinking on some deeper levels. At some point in the next few nights, I'd love to share with you some of my thoughts on this switch in direction. How does it happen? When does it happen? What elements collide to suddenly transform the mind and behavior? It's fascinating to me. When something fascinates me, it's hard to let it go until I unravel it and figure it out the best I can. I may not always be right and the conclusion might be one specific to my set of circumstances. However, the most remarkable thing to me is how many of us seem to relate on numerous nearly identical levels despite having different life circumstances. I'm calling it a night. I've had my #lastfoodofday and I'm tired. I'm not setting an alarm tonight. A good long rest is what I need and I'm going to get it. Last night I discussed time management issues and today I did okay until I decided a nap at 4pm was a good idea. In hindsight I should have pulled myself together, grabbed some fruit and hit the door for the Y. I was tired today. Not because I didn't sleep well, because I didn't get enough. It's sometimes difficult to "listen" to my body because with all of the sleep issues over the last three years, my body constantly thinks sleep is the best choice in almost any situation. I set the alarm for 5:15pm. The plan was simple and good. Up at 5:15, shoes on and to the YMCA for a workout--stop by Irene's house where my daughters and Noah were having a dinner get together for some quality visiting time--grab some Hawaiian Fajitas from the little Mexican place across town--help a friend with uploading pictures to their facebook page--write--then bed no later than 10pm. That was the plan. But the nap was good. It was so good, in fact, I slept soundly through my alarm at 5:15. And with the phone literally less than a foot from my face, I slept through seven missed phone calls and ten text messages. This might have been my body trying to tell me something. I just wish it could have waited until after the planned evening to go into such a deep and restful sleep. I woke at 8:30pm after a 4.5 hour "nap," completely disoriented--having a quick panic attack thinking I had overslept for work, then realizing what had happened. I sat on the edge of the bed doing my routine post sleep self analysis. Wow, that was deep and amazing. I immediately recognized this feeling of fantastic--the feeling of good, healthy, solid sleep. On one hand I was in awe of how wonderful I felt physically and on the other I was completely upset with myself for allowing it to happen off schedule, so to speak. I gathered my thoughts and decided to make it to the YMCA for a good workout on the killer elliptical (name I've given it), then straight home to cook something for dinner. Then I realized I needed some groceries. Hmmmm... Okay, revised plan--workout, groceries, home and cooking followed by writing then back to bed. I ate dinner at 11:30pm. I combined my dinner with my last snack--the calories were a little pricey at 749 total--but it was within my budget and it served as my #lastfoodofday. And it was quality. I whipped up some homemade guacamole using a small avocado, onions, tomatoes, ground black pepper and a serving of lite sour cream. I made a 4 oz lean hamburger patty, put it on a 100 calorie sandwich thin and topped it with a slice of mozzarella and some of the guacamole. I added a pear and a serving of all natural brown rice chips. The brown rice chips thing is a test. I wanted something to dip into my homemade guacamole. It was the only bag I could find that didn't contain sugar of some sort. The all natural sweet potato chips I wanted contain cane sugar. Now, the test is--can I have a "bag" of anything like this in my apartment and maintain sanity and portion control? Stay tuned! I called all of the people who had been expecting me this evening and apologized for my absence. Everyone understood. I made sure to talk to Amber and Courtney and Amber even put the phone up to little Noah's ear. She told me he smiled big upon hearing my voice. That made me feel better. I realized tonight how I've drastically cut down on eating out. I would have to go through my Twitter feed and count to be sure--but I know for certain it's been more than a week. I'm having a bunch of fun planning and preparing my meals, so I guess I haven't missed it really. I had planned on eating out tonight with those amazing Hawaiian Fajitas--and despite my revised schedule and plan to cook, I tried to grab them after my workout. When I pulled up to the restaurant at 9:55pm, it was obvious they were already closed. Maybe sometime over the weekend. It was back to my revised plan. What am I going to do about my schedule? It's a struggle for sure. The elements involved are very important to me and my recovery. As upset as I was with myself, I did stop it before I started being abusive to myself. That's a major plus. I didn't dwell on it too long or allow it to influence me into making some bad choices in a rush. I could have grabbed a Subway sandwich, skipped the workout, finished blog and then dropped in bed trying to force myself back to sleep. But I knew better and wanted better for myself, despite the circumstances. I'm proud of the way I handled this situation. I didn't let it negatively affect my resolve and that's serious progress. It still leaves me in a position to evaluate and correct my time management plan. But as a supportive friend said after reading my live-tweets through it all-- Rome wasn't built in a day. I've experienced a dramatic turnabout in the last 6 weeks. It's been a wonderful blessing and answer to a prayer, or many prayers actually. I've had life altering epiphanies that have had and continue to have positive deep seeded behavior changing effects. I'm happy. I'm sometimes burning the candle at both ends and struggling to define some self imposed boundaries to correct the sleep schedule--but I'm making it an important focus and most importantly, I'm not giving up in any way, shape or form. Finding a balance with time management has been a challenge for me. I remember having this same issue when I started this blog. The things I'm doing, the elements of my recovery are all important and each has their place, an importance. Realizing that the challenge isn't any of the elements, it's the time management of everything as a whole, is an important distinction. Better quality of sleep is helping. Not getting enough sleep isn't helping. I understand that this will not change unless I make it a priority. I remember when I was in the middle of my initial weight loss and I decided it was a great idea and a wonderful time to pursue a lead role in a dramatic play. I had always wanted to act and with the new found confidence within me I won the role and had the time of my life. And I was still working full time, still exercising consistently, still writing nightly...and all while committing to a six week/5 day a week rehearsal schedule. How did I do that?? I honestly don't remember. I think it had a lot to do with how much passion was involved and how much joy it brought me. It was truly a dream come true and I was living it so wonderfully, that perhaps the adjustments needed in the schedule just effortlessly conformed. I'm once again experiencing a considerable amount of passion and joy, but I wouldn't say the schedule is effortlessly conforming. Adjusting will take deliberate actions; choices best suited for doing what I love while maintaining and taking care in other areas of my life. This is one of the issues near the top of my priority list, right up there with the key elements involved in taking the best care. Three different people in the last few days have commented on my weight loss. All three have said the exact same thing, "I can really tell in your face." Isn't that always the first place people notice? I think that's simply because it's where people are focused the most. We look at each others faces more than anything else. I'm excited because not only can I see it in my face, I can see it in other areas too---and most importantly, I can feel it all over. It's interesting: The thought of taking pictures of all of my food and sharing it via social media was once something I was absolutely against. I didn't want to be judged. I didn't want anyone to feel like I was saying, this is what you should eat (because that ISN'T what it's about at all), and let's be honest--I didn't want the accountability. <<< That. That was the biggie. What I had been doing was a product of my inconsistency and struggle. I've written about having a few good days followed by four bad and another two good and so on---and during the good times I might enjoy preparing a fabulous meal--a meal so wonderfully suited for me--calorie wise, taste wise and everything wise...so I would take a picture and post it to my facebook page. But it wasn't indicative of anything other than that one meal...because the next day I might be eating God only knows what--and where's the picture of that? Nobody wants to see my fried catfish (not a bad calorie value, really) and three hundred calories worth of tarter sauce (horrible calorie value, really). The point is, if it's accountability I wanted and honesty--then I needed to go all or nothing. And in doing so for all the right reasons, I've found my initial objections have all faded away. I'm loving it. I mean--like, looking forward to it-kind of loving it. Not one person has expressed judgement of any kind in any way. I've clarified my objective several times--It's a tool for me. Having this accountability tool in place inspires me to eat better, to slow down and enjoy not only eating my food, but preparing it. And in this, it's inspiring me to take better care. I still eat what I like and nothing I don't. Trust me--if I don't like it, I'm not eating it. It doesn't mean I'm not open to trying new things--it simply means if I try it and hate it--it'll not be back, ever. You're welcome to follow the live-tweeting of food and exercise on my Twitter page by clicking here. I had two workouts today. I didn't officially count the first, but it still counts because I'm a little sore from the experience. I helped a friend clean up his private dock at the lake this afternoon. I was balancing on loose rocks, climbing insane angles up and down a ramp affected by seriously low water levels and bending over, over and over while picking up debris. I was stretching and even dancing. Well, I wasn't intentionally dancing. A couple of times I was doing what might have appeared to be a dance while I dodged red hornets--and at one point I stepped on a board and out shot a big snake. This thing was at least a few feet long. I don't know what kind it was, maybe a blue racer? All I know is, when he shot out from under the board and into the water, I was dancing a nice fade away in the other direction. The other workout was a good 1.7 mile walk in the park this evening. I plan on another YMCA visit tomorrow. I'm settling down into a nice groove and it continues to feel amazing. I still have issues I must address, like time management and drinking more water. But I must say, overall I'm very pleased with myself these days. When I stopped writing the blog everyday--and then sporadically at best--I suddenly didn't have the same support system and accountability factor... And things were okay for a almost a year and a half. They were because everything seemed great--I was writing my book, I staying connected with people and life seemed rosy. When it stopped being all peaches, is when suddenly I discovered I had abandoned every tool that brought me so far. Like a kid who's trying to ride a bike for the first time with the training wheels off, I stumbled time and time again. But my foolish pride kept me from re-installing the training wheels and getting back to basics... That is until the mud of one too many ditches made it very clear, I needed to get back to what worked for me. Training wheels on! Still, I wouldn't trade this experience, really. I needed to be humbled. I needed to see all sides of this journey. And thanks to regaining--I've been able to go back and investigate the areas where I clearly need more study. I call it a blessing in disguise, 100%. I also didn't give my food addiction the respect and consideration it needed. I didn't want to accept it completely. So once again, I learned the hard way--there are certain things I mustn't eat. When I consume sugar, I struggle--I binge. When I don't, no struggle and no urges to binge. And when I'm not fighting the battle of the binge--it frees me to focus on the food and exercise fundamentals and the very important practice of maintaining my accountability and support system. This presentation tonight was in advance of our next weekly teleconference support group. If you're interested in signing up for the six week program starting June 3rd, please email me your intention: Sean@transformationroad.com. The weekly support group is Tuesday evenings at 8 Eastern, 7 Central, 6 mountain, 5 Pacific. It is very different than what we did tonight. It's a lot of one on one, exploring you and your experience--your puzzle and offering support toward helping you achieve your weight loss objectives. The weekly group includes a private Facebook group for call members only and unlimited email, text, and call support when needed. Think about it--and I'll have sign up details for you in the next couple days. I prepared some amazing turkey enchiladas tonight. I had them oven ready before the teleconference tonight, then finished them and enjoyed the dinner shortly after. 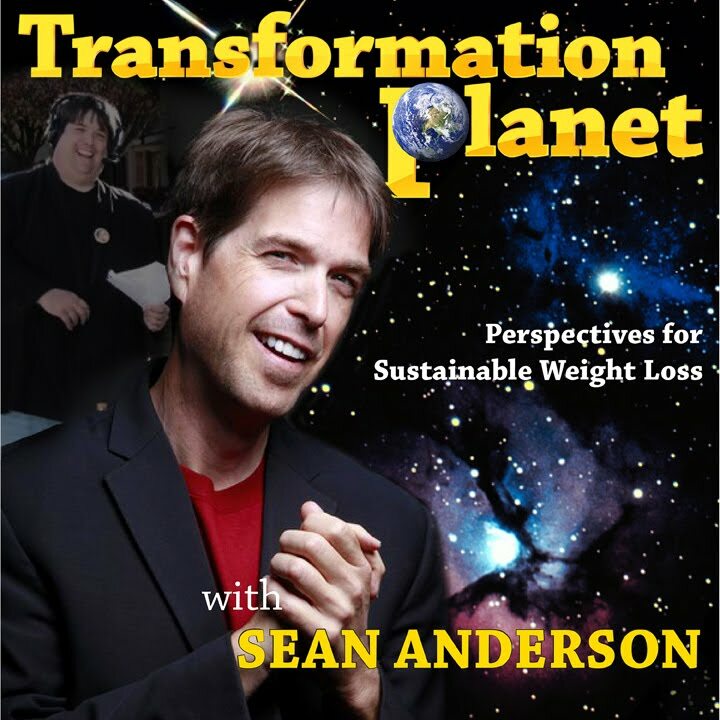 The picture, along with everything else I eat daily, is on my Twitter feed: @SeanAAnderson I also enjoyed an incredible workout tonight at the YMCA on the elliptical. It is getting easier and easier to handle. I'll start upping the resistance and duration very soon. I started today by remembering loved ones I've lost. Some left us way too young. As I searched for pictures of several to share on my facebook page, I started imagining what life would be like today if they were still with us. I wish I would have had more time with each of them and in the case of my big brother Danny, I wish I would have had a chance to meet him and know him. Instead of letting this train of thought bring me down into a depressive state, I did my best to mine some inspiration from it all. Danny didn't know 42 years was all he would have. My brother Shane had no idea life would be a short 24 years and Clarke Hodson (My Big brother in The Big Brothers/Big Sisters program) still had a lot of life ahead of him when he passed at 57. I couldn't remember how old Clarke was when he passed, so I Google searched his obituary and was touched when I discovered my name mentioned. I didn't know his family included me like that. "Clarke believed life should be a life-long learning experience and accomplished this through his employment as a teacher and later in life as a Training Administrator for Accurate Labs and as web master for OWPCA. Clarke and Debi shared their love of education and animals over 17 years as docents for the Tulsa Zoo. Clarke became involved in Big Brothers/Big Sisters early in his life, which led to a long and memorable relationship with Sean Anderson." I knew how much he meant to me, I guess I always wondered if he felt the same about me. After his family insisted I sit up front with them at his funeral and now discovering this, I think I have my answer. I believe Clarke was right, life should be a life-long learning experience. I feel the same. I never want to stop learning. I slept better last night than I have in a very long time. I know I said those exact words not too long ago, but this was even better than that night. I slept soundly for eight straight hours and woke feeling refreshed and fully rested. It was incredible. I took time and care in preparing my food today. This is really a big difference in me--to be so attentive and caring about the process of planning and preparing what I eat. I didn't give it this much attention when I initially lost weight. Instead of this increased attention and care being perceived as a burden (which is what I thought it would be), it's become very enjoyable. I look forward to it every day. Talk about changing perspectives, this is an example! I planned on doing a 5K walk today and by golly, I did it. Actually I did 3.44 miles, a little bit longer than 3.1 for the 5K. I really thought my elliptical workouts was giving me a better workout but after doing this, I don't know. I'm beat in a good way. So much more I wanted to discuss in this post, but it's getting late. I must hit the pillow. Tomorrow night, Tuesday May 27th at 7pm Central, 8 Eastern, 6 Mountian and 5 Pacific--Life Coach Gerri Helms and I will present a very special teleconference program entitled "The Missing Piece." 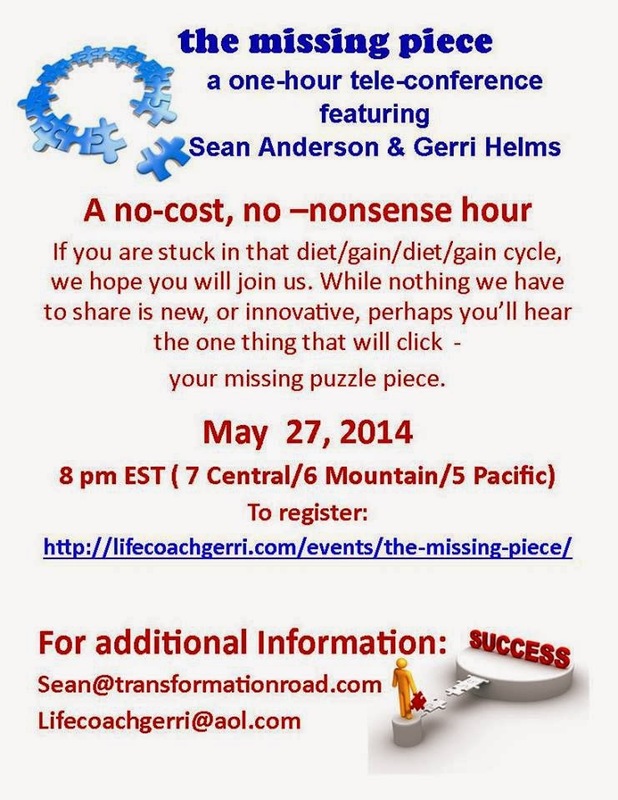 It's completely free, but you must register by clicking this link: http://lifecoachgerri.com/events/the-missing-piece/ After you register with your email, we'll email you the teleconference phone number and access code. We all have a different puzzle. Perhaps this presentation and question/answer session afterwards will help you fit a few more of your pieces together! I hope you'll join us. Carrying all of the equipment last night made me incredibly sore today. Wow. I guess I could say I had two workouts yesterday! I gave myself a break today on my workout and it was good. I plan on doing a 5K walk tomorrow. Thanksgiving 2008 was the first "Anderson Family Holiday 5K," and other holiday 5K's followed, so tomorrow I'll bring it back. Not today though...my goodness. When the rain was pouring and I feared my equipment might get destroyed, I carried heavy things quickly. I didn't even think about it, I just knew I had to get them somewhere dry. The soreness isn't a, "I hurt myself" kind of soreness, it's a good kind of sore, I suppose. Food planning went well today. If you're a regular Twitter follower of mine, thank you! The accountability the commitment creates has proven to be remarkable. Every bite, every day...picture and calorie count. I've really embraced it and had fun with it along the way. I visited my grandson Noah today. I had him all to myself for about 45 minutes. We had a fantastic time. He motivates me and inspires me to take better care. He's going to have a very young and active grandpa, for sure! We eventually watched some SpongeBob together and it's amazing how he becomes mesmerized while watching. Courtney tells me that he eats more when there's a TV within his view. No TV, he eats much less. SpongeBob on, he'll mindlessly open his mouth for more. Isn't that interesting?? As someone who has done a bunch of mindless eating in front of a TV screen, I see how this might be a natural human thing. 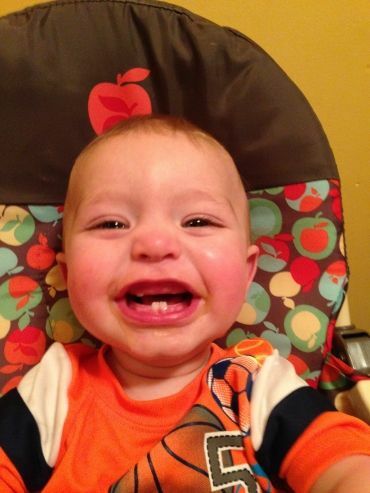 I mean, really--he's 10 months. He's so fascinating and smart! And he loves my phone...loves it. I prepared a dinner for Amber and KL this evening. It was nice sharing a meal with them. I always LOVE our conversations. I grilled some chicken thighs and drumsticks with asparagus. It was something different. That's one of the biggest challenges I've had over the course of the last month, plus--having enough variety. I like what I like and I never force myself to eat something I don't. What I do like, I tend to have it often. Preparing something new this evening was a good practice. One thing I've noticed lately is not being hungry between meals. I believe in the "eat something every 3-4 hours" advice, because I get how the metabolism is like a wood burning stove. Lately though, I'm just not hungry between meals. I do find myself occasionally having a planned snack because "it's time to give my metabolism something to work with," and I suppose that's okay. I certainly don't know everything about nutrition and the science behind it all, not even close, actually. And I'd really like to keep things very simple. What are your thoughts on this topic? If you're not hungry, do you skip the snack or eat it in the name of fueling your metabolism? I'm afraid if I only ate when I'm hungry, I'd barely hit 1,000 calories a day. I'm not complaining at all. It's just something to ponder. This is probably one of the shortest and quickest updates in recent memory. You're welcome to see the food I eat on Twitter (link above) and friend me on MyFitnessPal, I'm SeanAAnderson on MFP. This has been a very long day. I'm so relieved it's over! I knew in order for me to accomplish everything I needed to accomplish today, it would take sticking to a plan. This is the kind of day I could have easily said, oh well, it's one day...but I didn't and I'm reaping the positive feelings that come with a plan well executed. And I did it all without getting electrocuted. I'll explain in a few. The positive momentum has been building and now it's important for me to not get too excited. I must relax into the groove of this momentum and remember to take it one day at a time. I still make a point to visualize my success each day. Sometimes it's very tempting to get ahead of myself, I certainly know I did during my initial transformation. But this is what happens when you're feeling great. Suddenly, you're thinking about all of your future possibilities. And it's about so much more than weight loss. This excitement within me is about everything under the sun. Never before has an epiphany effected me in such a profound way, as the ones discussed in the May 15th and May 17th posts. I've been blessed with several since starting this journey in 2008 and some of them have made a huge impact...but this one, wow...all of the others are awesome, but they pale in comparison. In the last week I've given much thought to my next book. I'm not quite ready to write it, I still have more to experience-more to learn, but I certainly have been considering the message. Again, getting ahead of myself. I think, "The Other Side of The Scale--Now What?" is a good working title...Okay--see? Ahead of myself, right. The most important things for me right now are to take the best care of me I can and continue to develop organically, in positive ways. I hit the elliptical at the YMCA this afternoon ahead of my big wedding night dj experience. I'm having fun at the Y and it shows in my attitude and intensity of the workout. Walking in there with this new perspective has been an amazing blessing. Walking at the trail would have worked wonderfully and I could have continued to avoid the Y because of all of the irrational fears I was carrying. I'm so glad I let it go. Just let it go. Dropped them and made my way in. It was a great move. The 60% chance of rain tonight quickly turned into a 100% chance of heavy thundershowers. And it did at the same time I was set to load in and set up my equipment for a wedding. I was using an open pickup truck to transport and when it started to come down in sheets with big cloud to ground lightening strikes, I had to move quickly to get the equipment someplace dry. As I started unloading as quickly as possible, the rain and lightening started coming heavier and heavier. It was a complete washout. Every part of me was soaked, down to my unmentionables. I looked and felt like I had jumped in a pool fully clothed. Most of the tents for this outdoor event were blown down (including the tent assigned to my setup), some looked destroyed. The photographer's portable photo booth was a complete loss. Good thing it was a big home with an extra large covered patio. That's where we eventually set up most everything. The first song I played was Luke Bryan's "Rain Is A Good Thing," they didn't fire me for the obvious joke and we were off and running to what turned out to be a fantastic event despite the rough start. I mean really, we do need the rain. I packed a dinner that resembled a lunch, with a sandwich and three kinds of fruit. After discovering what elaborate catering means for 250 people, I could have easily navigated the selections and stayed on plan. But I didn't know that going into this night. Taking the time to plan my food for this event is about more than the food. It's about making me and my needs important. Taking the best care of me, in this case meant packing dinner. The caterer approached me at one point to ask "what's that on your plate?" It was my smoked ham and swiss on a 100 calorie multi-grain sandwich thin. She seemed a little taken aback. Probably not too many people bring their own food to a wedding reception. The wedding planner set up the cake table right next to me. I haven't laid eyes on so many beautiful cakes in all my life. But that was the only attention I gave the cake table. Enough to acknowledge the obvious quality and quantity, but not even the first thought of consuming the sugar. I can't deny the obvious benefits from cutting out 99% of sugar from my daily intake. It's meant no binges or urges to binge, at all. And that's nothing short of miraculous for me. Sugar is listed as an ingredient in the non-dairy powdered coffee creamer I use every morning--but other than that, and the recent "sugar in my marinara" discovery, I've been nearly sugar free for well over a month now. The amount of sugar in the creamer must be minuscule because it hasn't bothered me at all. In last night's post I mentioned being insecure in my abilities as a mobile dj. It's completely different than what I do as a radio personality. The thing is, the title of "dj" is often applied to both--so the line gets blurred. I'm happy to report it went very well, nothing like I feared. It was fun! It's another late night for me. My #lastfoodofday was a simple egg white omelet with a few mushrooms and a slice of mozzarella for 109 calories. The #lastfoodofday hashtag on my Twitter page has acted as a book-end for me. When I use it, that's it, I'm done for the day. Feel free to use it too! I'm sleeping in tomorrow morning. Or, I guess I should say, this morning. I was on my way to a friend's house one night for a wonderful dinner. It was to be a nicely balanced, calorie friendly meal and of course I was on my best food behavior. "No, thank you--no dessert for me!" What my friend and not another soul didn't know, was how I was lusting for a binge while driving across town for this dinner. And I wasn't salivating for the meal I was about to consume, I was fantasizing about the giant double cheeseburger and large ice cream shake I planned on buying later, after dinner. Now, take that actual happening and multiply it by, hmmmm... I don't know... a lot. The kid at the drive-through had no idea he was playing the part of my dealer. Like a paranoid drug addict, I would literally look from side to side, back and forth--making sure nobody caught me while exchanging the money for the goods. I always waited to insert the straw into the shake until I was safely undercover, far from the well lit main drag, on the darkened residential back streets that lead back to my dungeon, I mean apartment. Driving slow and sucking in the first tastes of that high calorie dose of sugar and fat was always the best. Then, with each additional mouthful, it just wasn't as good. Maybe I started mixing some guilt into that shake and a dash or two of shame. When the cup was empty, I'd feel like I was about to burst--completely miserable. The negative inner dialogue was relentless. Then, as if making a new deal with my abusive thoughts (I'd tell myself anything to make them stop), I'd sit in my recliner and promise myself it had been the last time. No more, no more, no more...because maybe if I grab control now, nobody will be the wiser about this--I'll return to my healthiest weight and take these dark secrets to my grave. The next time would also be my last until the next time and so on. So much for taking the secrets to my grave. Weight gain is terrible at keeping secrets. A wise person once said "You're only as sick as your secrets." Yeah...that. The schedule today included an early remote broadcast with two clients promoting a customer appreciation cook-out. They had all of the expected items: Hot dogs, chips, cookies and soda. I was well prepared. I packed a turkey and provolone sandwich with plenty of fruit into my man-bag just before departing for the event. I wasn't the least bit interested in the food they were offering. I wasn't, not even a little bit. It was as if I was a completely different person. Suddenly I've become someone who plans ahead, sticks to my plan and doesn't negotiate with errant thoughts. But there wasn't any errant thoughts today. Just peace and calm. I waited until it was a good time to eat lunch and I dined right there at the broadcast. I politely declined repeated offers and encouragement to indulge, "Hey, those dogs are hot off the grill--doesn't get any better, you should get you one." No thanks, I brought my own food. "We got cookies!" I see that, yes, yes you do. "You want half of my Doritos?" Nope, I'm good, thank you! This experience left me feeling enormously grateful for the strength that is nothing short of an answer to a desperate prayer. I enjoyed some good snacks later in the day, took a little nap and made my way to the YMCA for a solid workout on the elliptical. I must look half-crazy on that thing, lip syncing to the music that moves me--but I can't play air-instruments because my entire body is involved in the workout. I get so into it, I don't even notice if anyone else notices my antics. And I don't even care. Even if they did, I don't imagine a negative reaction--quite the contrary, it would probably be something like, "Wow, look at him go, he's really into his workout! Good for him!" Trying to decide on dinner tonight was a little challenging. I had some things at home but it wasn't what I wanted. I wanted to grill out. It's Memorial Day Weekend after all! I put my ear buds back on and headed into the grocery store as Walk Off The Earth's REVO filled me with positive energy. I grabbed some veggies to grill, some fruit for "dessert," a pre-cut bag of shoestring all natural sweet potato fries and a top sirloin I found on sale for $2.88! Dinner was on. And it was good. 610 calories worth. I couldn't eat it all and ended up adjusting the calories down to 580. I'll be up late tonight working on the final preparations for a wedding reception I'll be DJ'ing tomorrow evening. I don't usually do mobile dj work, but a friend recently gifted me his old equipment and when he declined the date, he told them to call me. For some strange reason I said yes. Oh yeah, they offered to pay me, that's why. Just between these pages, I honestly don't like doing mobile dj work. It's completely different than what I do on the radio. I don't feel very confident in my dj'ing ability, is what I'm saying. But I accepted the gig and I shall give them my best. I mean, it is one of the most special days of this couple's entire life, I suppose I better give it everything I got. I plan on packing a good, portable dinner tomorrow evening. I don't want to be caught off guard by the wedding reception buffet. Again, I'm pleasantly surprised by this fantastic feeling of control, purpose and positive spirit. The recent identity-self-worth epiphanies have been working their magic on me. I spend a lot of time alone and usually I don't like it at all. But you know what? I'm digging it. Suddenly and effortlessly, I don't mind being alone as much. In fact, I kinda like me a lot. It's like getting better acquainted with a long lost friend you promised yourself you'd take the time to get to know someday. You're welcome to follow me on Twitter: @SeanAAnderson I post pictures and calorie counts of every bite of food I eat. It's an extreme accountability measure. And I don't say "extreme" in a negative way. It's simply working well for me. And something important to remember--I don't post the pics as an example of what anyone else should eat. I wouldn't do that. What I like and what you like may very well be two different things completely. And if you're also on this road, I believe it's important to eat what you like. I do find myself taking extra time and care in preparation of my food--and plating it nicely for the camera...and that's nothing but good because it slows me down and allows me to enjoy my meals and snacks even more. The food picture Tweets have been an invaluable tool of my recovery. If you enjoy that type of thing (the food pics), then awesome, it's a win-win! I'm also on MyFitnessPal under the user name: SeanAAnderson I welcome you to friend request me there as well. One of my MFP friends pointed out today that my stats still say "0 pounds lost." It does because I haven't updated the weights in there. I've used MFP strictly for logging my food and exercise. I suppose I could sit down and go through entering all of the different weights in order to get an accurate profile display, but I just haven't had the time. I may do that sometime over this holiday weekend. The positive momentum building here is palpable. That weigh day yesterday, even if some of it was water weight, was over the top. I've been here, I know what's coming and it will slow down, of course. I'm feeling ready for the road ahead. Some of the mysteries are gone, replaced by experience, hardened by lessons--and that's wonderful. I'm taking a do-over. I thank God that I didn't slip all the way back. I'm thankful I didn't delete this blog when the darkness of the spiral suggested it was the best thing to do. It wasn't the best thing to do at all. But in that mindset everything is flipped, the good things seem repulsive and the bad things alluring. This chance I've been given is an opportunity to move forward into a familiar territory, armed with a fresh perspective, a new appreciation, a reverence for things I didn't give a chance before. I'm not a failure. I'm not a failure. I'm far from it. In fact, I'm a success. If this sounds like positive self-talk working hard to defeat some deceptive inner dialogue, you're right, it is--but there's a difference now. It doesn't have to work very hard because I believe it. I truly believe those words so deeply, it's become a thing within me. I'm proud of my success. I'm proud of my experience and what I've been able to learn. How much better will it be to reach a healthy weight again and understand that I deserve to be there? To not feel like a stranger in my own skin because this time around I've taken the time to reacquaint myself with the real me, will be a very powerful thing. And the great thing about this developing relationship is, it isn't something I'll receive when I reach some magical point along the way. It's developing now. And I reap the rewards regardless of my weight. The best thing that happened today was a phone call from mom. 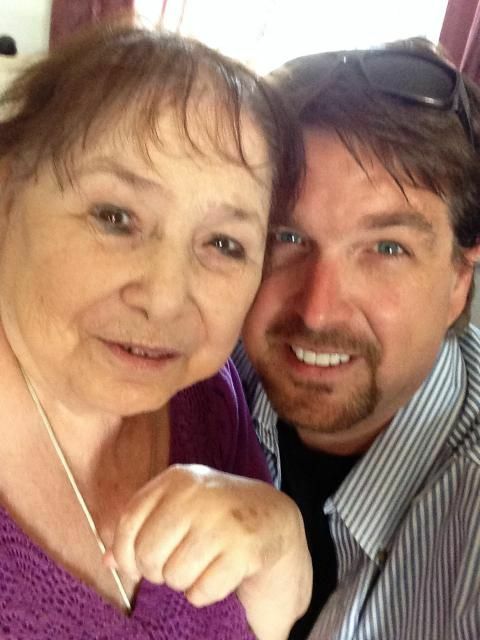 Last June I accompanied her to the Stillwater Senior Center to see about mom becoming a regular visitor. She enjoyed the tour and seemed genuinely excited to get to know so many new people. But brewing in her was this negative inner dialogue about how she would be received. To anyone that knows my mom, you know she's one of the most loving people in the world. Her smile, her conversation, her spirit--has a way of brightening everything. She is easily loved by all who meet her. Still, she harbored a deep fear of rejection. What if they don't like me? She's struggled with this for almost a year, even suffering sleepless nights full of anxiety over imaginary scenarios where she's rejected or simply not liked for whatever reason. I understand where that stuff comes from, I do and even while I was doing similar things to myself--I kept trying to encourage her to break free from this hold. Today she did it. I was at the studio working when she called and told me the great news. It was a wonderful experience for her, everyone was friendly and she's planning on going back a few times a week. Talk about breakthroughs! This is a major breakthrough because she's risen above the negative and untrue inner dialogue, taken a chance and now she's free. It's like me and the YMCA situation not too long ago. I'm so very proud of my mom. Today was a little bit turned around for me. I was about to head to the Y this afternoon, until I got summoned into work by thunderstorms moving through. This changed my plan. It was workout, dinner, writing. Instead it was working, dinner, writing and workout. The rain has left a super moist smell in the air and it's so inviting, I'm headed out there within minutes for a good walk. Tonight's workout will not be as intense as the elliptical, and that's okay. It will be intense in other ways. When I stepped on the scale in January I was hoping the number attached to my obvious weight gain would immediately jolt me into action. The scales showed a 143 pound gain. There I was, 373 pounds, a weight I promised myself I would never see again. I made the same declaration at every major milestone. I remember crossing down into the 400's, 300's, 250--and every time "I'll never see that number again!" What went wrong? A few things. I didn't give my food addiction the respect it deserved, certainly a form of denial. I honestly believed after maintaining my 275 pound loss for nearly a year and a half, perhaps I could be normal--completely normal with food. I adopted a cockiness about it, like hey, I got this! Then I experienced emotional turbulence and stress, succumbed to a heavy dose of depression brought on by a constant state of exhaustion from severe sleep apnea...and within a short amount of time I was medicating with food, coping with food--surviving with food, again and again, just like the old days. During this downward spiral, the struggle seemed magnified between good and evil, between what I knew was right and everything else. Not only did I feel bad for how out of control I was--I felt worse because this wasn't supposed to be me. After that sobering weigh-in, I did jump back on track for a little while. I managed to lose 10 pounds and I celebrated it as proof that I could still lose weight. I started writing more, I jumped back on the weekly conference call with Life Coach Gerri Helms where we discussed all of the issues included in weight loss with a wonderful group of participants. Make no mistake, even in times of my greatest struggle, I could relate and offer sound, quality advice. Talking the talk is one thing. I can sit down one on one with you and we could have the most inspiring-motivational discussion ever, and then as if possessed--I can go about doing the polar opposite for myself. I had a few good days, then several bad, followed by a couple good--and so on. My writing became sporadic once again and I was clearly struggling. I was fighting. I was hurting. I just wanted to scream out to the heavens, "Why is this so hard this time??? Why???? Am I destined to go all the way back??" The 143 pound gain and my constant attempts to get back on track seemed to be pushing me even further down. I felt horrible about myself with a long list of reasons why. The struggle continued and clearly I was gaining once again. The worst of it was running out of clothes. I wore the same outfit to work everyday for weeks on end because nothing I had in the closet fit anymore. Sometime in early April, I don't remember the date--I know it was a Saturday, I had a remote broadcast. I couldn't wear stretchy sweat pants to a public appearance, so I squeezed into the largest pair of pants I owned. The size 50's were a far cry from the 36's that felt so loose and wonderful at 230. And they didn't fit. I made them work for this broadcast. I was in pain the entire time. My right leg had recently started swelling again because of the dramatic weight gain and it pressed tightly against the pant leg of these jeans that were suffocating me. I spent the entire broadcast trying to conceal the obvious issue with my leg. I stood in strategic spots where I thought it would be less noticeable. I peeled them off when I got home and discovered I was bleeding from their tightness. A few days after that painful experience, I walked into the doctors office and faced the scale once again. I just knew I had to have crossed back into the 400's again. I certainly felt like it. Maybe this time would be the dose of reality I needed. The scale shot back 394. I had put on 31 pounds in record time. I didn't tell a soul, I was too ashamed, embarrassed, guilty, sad and desperate. I eventually told my mom and a couple of others, in order to express how bad things had turned. Now what? I was ready to throw in the towel. Even 394 staring back at me wasn't enough. I still struggled, still felt possessed and driven to self destruction via food. On one of my darkest nights, I emailed Marty Lerner, the director of Milestones In Recovery in Florida. Milestones is an in-patient food addiction treatment center. If you've read my book, you might remember Marty Lerner Ph.D., he wrote a fabulous review in the opening pages. I asked Marty about the costs of a 30 day in-patient stay at his facility in Florida. He was very nice in his reply, although the cost immediately disqualified it as an option. It was now or never in my mind. I started an intense prayer and meditation campaign. I spent time seeking council from my therapist. I sought advice from Life Coach Gerri Helms. I studied all I could online about recovery for someone like me and I reached some concrete conclusions and solutions. When I started struggling, one of the first things I did was stop writing on a regular schedule. I also stopped logging my food on MyFitnessPal. Getting those things back in order was paramount if I really wanted to recover. And as I did, I discovered an enormous amount of love and support waiting for me--and it was always there--even when I isolated and felt so alone, I wasn't alone. I have enjoyed almost a month of daily writing on this blog. In committing to this writing schedule, I've kept in touch with my emotions--writing it out each night and learning more each day. Recently, I've experienced some groundbreaking personal epiphanies about my identity and self worth that are poised to have the most wonderful effect on me...they already have, actually. And I've shared it all right here in these pages. I've maintained my food and exercise log in MyFitnessPal and as an added source of accountability, I started tweeting pictures of every single calorie I consume (And I'm having fun doing it!). I've committed to working out on a consistent schedule too. This is how I'm recovering. I'm doing what works for me, what I need--the writing, the food pics, the regular contact with close supporters who have been here, like Gerri. I'm making my private spiritual side important too. I've offered support to others as best I can and I will continue to do more. All of this is a direct reflection of my importance level. It's turned all the way up. Because I'm not giving up, ever. Today was weigh day. And I will weigh every three weeks. The next weigh day is Wednesday June 11th. I stepped on the scale today and discovered a 25 pound loss. 25 pounds!!!!!!!!!! From 394 to 369. Hang around a while because we're going to have some fun. I haven't been this happy about weighing 369 since I first broke 370 during my initial 275 pound loss. And that's an important point. Because not only am I headed in the right direction physically, my perspective is also pointed in the right direction. If you're just now tuning in, reading only the latest entries, then you might think: Wow, this Sean guy has it all figured out! That would be a very incorrect assumption. I don't have it all figured out but I'm doing my best everyday. I've established support and an ultra high level of accountability. I'm doing what works for me. The thought of committing to a writing schedule and tweeting pictures of every single bite might seem excessive and unnecessary to some. For me, it's the reason why I'm actually looking forward to getting on the scale tomorrow. After twenty years of being near, at or above 500 pounds, I tasted the freedom a healthy body weight provides and it lasted for about a year and a half before I fell into the same patterns of my past. Emotional circumstances, life changes and so many variables accompanied the weight gain that has brought me back today. The biggest lesson I've learned is all about denial of addiction and how just when you start thinking you've got it all figured out, you must check yourself, and check yourself fast. The emotional epiphanies of late have been nothing short of ground breaking for me. I'm re-building a foundation for myself. A foundation that will support a lifetime of recovery and all of the wonderful freedom it and a healthy body weight affords. And this will be a life work. There isn't a finish line. Why would there be? So I can turn around and go back the other way? Acceptance and peace with the knowledge of what I must do to remain successfully in recovery is what it's all about. Instead of dread, I feel relief. I feel relieved because I've found hope and promise for a better life when I was seriously starting to doubt I could ever recover. I hope you still pick up your emails on this account. I picked up your blog on day 1 and I have not put it down since. I'm currently on day 142. I have followed your methods every step of the way and I'm achieving some fantastic results. 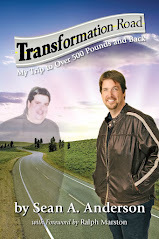 The moment I opened Nick's email on my phone, I was sitting in the drive through line at Braum's Ice Cream and Dairy Store waiting on a thousand calorie dose of my preferred drug and hoping nobody in line or any of the employees recognized me as "that guy who lost all that weight and wrote that book and wow, he's put on some weight." If Nick only knew where I am right now, not just physically--in this drive through--but mentally and emotionally--he would likely be shocked, I thought. Realizing that I had no idea who or how many might be reading some of the over 820 postings in the archive of this blog, there's no way I could just delete everything. I couldn't do it. And I'm glad I didn't. My hope is, someone like Nick might keep reading and learn from not only my success, but my relapse and recovery. We all want long term results. None of us start out thinking, hey--I'd like to get down to a healthy weight to see what it's like--just so I'll know--then I'll be back. What I'm doing now is what I must to take the best care of me and experience not just long term results, I want long term recovery...that's the goal. And isn't it poetic that some of the people expressing gratitude toward me, have actually played a key role in my turnaround? I'm enormously grateful for their support. Today was a fantastic day in several ways. I'm constantly trying new ways to carefully plan and prepare my food. Something as simple as dry grilling my sandwich on a Foreman Grill at lunch today, adds variety and a little excitement to my food plan. I enjoyed an appetizer before dinner tonight: Mushroom Pizza Cap! I love these things. 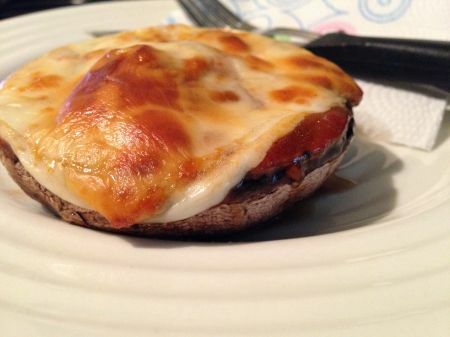 I took a large mushroom cap, filled the center with 1/2 a serving of sugar free marinara and a slice of mozzarella--and baked it until the cheese started to brown. It's one of the most delicious 123 calories of recent memory. Of course I LOVE mushrooms! I've found a lot of people don't. It's like a mushroom pizza without the crust! I eat it with a knife and fork...and napkins. My workouts on the orange trimmed elliptical at the YMCA have been progressively better. The biggest victory for me has been walking into the Y with complete confidence and not a shred of the emotions I wrote about not too long ago. Those fears and emotions were a big hurdle to get over and I just said a prayer, walked in and did what I needed to do. I've since ran into several people I know--many whom I exercised alongside during my initial weight loss--and NOT ONE has given me anything but the most supportive words and sometimes it's just a smile. I'm happy to see them again too. Thank you for reading and being so wonderfully supportive. If something I've written in these pages has helped you in some way, that's such a wonderful thing to me. It's precious to me, really. I'm just learning. I'll never stop learning along this road. I'm looking forward to weighing tomorrow and sharing it with you on my next post. The thing I've focused on the most the last several days has proven to be a wonderful exploration. It is, in short, the secret to happiness. Millions have figured it out already and they live it every day. Millions struggle with understanding it and they spend years, sometimes a lifetime in pursuit of it. The thing about loving and caring for the constants within us, the things that can't ever be taken from us, the elements making us who we are deep down no matter what comes or goes in this life is a key to emotional freedom. I think about the man in India who lives with his wife and kids in what can best be described as a tent. He gets up everyday and walks for miles into the city where he pulls a rickshaw, transporting tourist and business people for 8-12 hours a day. Then he walks home and has dinner (usually white rice and anything else they can afford) with the family he loves. He's one of the happiest people you'll ever meet. I think about the person who was able bodied their entire life before a drunk driver rendered them a quadriplegic. Yet, some of these people who have had so much taken away from them, are transformed into some of the most inspirational, positive and fascinatingly happy people in this world. I believe that people who find and live their happiness are doing so, because they're connected to the core qualities within them that can never be taken away. Whoever first said "happiness must come from within," this is what they meant. If we tether our identity, self-worth, definition of success and happiness to anything that naturally fluctuates or can change dramatically, then we're in for a roller coaster ride of emotional unrest. I've always attached my self-worth to my weight. Well, until now of course. I've often talked about potential and not living up to potential. But here's the thing: Potential is tied directly to the constant qualities within us and if our focus is on the pursuit of happiness in every direction except within, then those qualities aren't allowed to flourish, to grow--to give life to the potential within us all. This whole thing makes me want to take the best care I can. I've never felt more determined to return to a healthy weight. It's what I need physically. What I need emotionally isn't affected by weight loss. And making that distinction provides a nice inner calm, a peace. The question to determine these inner qualities needing attention and love is: What are the qualities in me that remain regardless of my weight, regardless of my financial situation, regardless of my relationship status, regardless of my professional success--what about me stays the same when all of these other things can and do change? My heart, soul, sense of humor, natural compassion for others, likes and dislikes, pride in parenting, artistic talents, selflessness, humility, etc. Have you made your list? And when these constants are cared for and loved, watered, so to speak--they grow, they flourish--and they give us what we need to experience emotional freedom, the freedom and ability to claim our happiness come what may. I slept on my shoulder a little too long in the same position again. I started the day with a hurt shoulder and at some point during my radio show, it severely affected my neck. Suddenly I became feverish and nauseated. I took a half day off and took care of me. In all, I've had Aleve, a muscle relaxer, a massage and a coating of an Icy Hot like product that is still working. Working well enough in fact, that I was able to go to the YMCA and absolutely crush my workout on the elliptical. On the way home from the Y, I stopped to visit with my grandson Noah. We had fun, talked a little to one another (me mostly talking to him--but give him a little while) and he made a point to fill my phone protector with drool...and that's okay! Because his drool is precious. Oh my goodness, I love that little guy. I prepared a great dinner tonight, completed my MyFitnessPal entries for the day, Tweeted my #lastfoodofday and wrote this blog. I'm ready to call it a great day. I'm very grateful for many things. My grandson Noah. Now there's a happy little guy! I remember not too long ago when I felt so far removed from any semblance of control. In that place it seems so hopeless and scary. I'm grateful to be where I am today. I feel strong and determined, like in the beginning of this blog. It's a new day and I deserve to feel great. You do too. I visited mom this evening and we dined at a buffet. I wasn't the least bit inclined to do anything other than stick to the plan. I selected a small lean sirloin, one slice of turkey breast, green beans, sauteed mushrooms, fresh strawberries, pear slices and a serving of cottage cheese with two crackers. My meal checked in at 559 calories. I added 15 calories for a non dairy creamer cup for my after dinner coffee and conversation with mom and my aunt Kelli and her husband Tim. Kelli has lost 50 pounds in the last year by simply eliminating sugary soft drinks. Way to go Kelli! I picked up some fruit and eggs from the grocery department at Braum's Ice Cream and Dairy Store on the way home, then stopped at Walgreens for some paper towels. Both of these places have been my "dealer" at one time or another. It feels good to walk in, buy what I'm after and be proud of my choices for a change. I'm sure it's confusing for some of the regular employees, "No ice cream tonight?" No thank you, I got what I want and need. I came home and decided to walk around my apartment community for a half hour. The weather has been beautiful here--perfectly cool for a nice neighborhood stroll. I did a little cleaning tonight, planned out some food for tomorrow and I'm headed to bed! Good day! By the way, I've explained the recent identity/self love revelation to a couple of people over the weekend and they related to it in a powerful way too. Lord knows it isn't something "new," but truly understanding how it works--experiencing the "click," after not properly understanding this my entire life has left me feeling renewed and even more empowered. It's been over 48 hours since the epiphany on the way to the YMCA that I wrote about in the May 15th post. And I still can't stop thinking about it. I feel like I was given a secret to a great mystery. This concept I discussed as it applies to me is universal too. This will be my TED Talk someday. Oh yeah, I don't think I've ever expressed my dream of speaking at a TED Conference. It will happen sometime within the next five years. I've envisioned it in detail, watching my imagination's best version. I'm 100% serious. Once understood, finding the core of who I am and have always been required a simple question: What are the qualities in me that do not change? If I'm 500 pounds or 230 pounds, what positive attributes do I possess at both of those weights? The same question can be applied to other things, example: If I won the lottery tomorrow, what positive qualities about me would remain from my previous financial existence? These core qualities are the ones with us through it all. Stability and certainty, instability and uncertainty. The list includes not only the way our brain works through compassion, empathy, sense of humor, intelligence, etc. It also includes our likes and dislikes, our roles as parents and grandparents--the things that bring us joy and peace, love and laughter. These things are often overlooked because identity and self-worth has been attached to something that fluctuates. My identity and self-worth was always hooked onto my weight. Someone else's identity and self-worth might be tied to their bank account. And another's might be tied to whether or not they perceive their current station in life as stable or unstable. Still another's might rely on the progression of their career. All of these things fluctuate. And through it all, we're still who we are within our core qualities. In order for these core qualities to flourish and enrich our lives to the fullest, they must be loved and nurtured like watering a plant. If they're neglected, they wilt and wither. I believe this is from where the expression "I feel dead inside" comes. And when identity and self worth is attached to anything else, these positive attributes get neglected on both sides of whatever is fluctuating. When the changing source of identity and self-worth is moving in a positive direction, we feel great about ourselves. And when the source is moving in a negative direction we feel worse about ourselves. Then we get into a tug of war, constantly battling to feel good. We've all heard, "Happiness must come from within." Now I understand how that can happen and I understand how it doesn't happen when we rely on external things that change. Money doesn't buy happiness. Losing weight doesn't magically fix us. Getting the big promotion or settling down into a relationship doesn't do it either. We're truly free when our identity and self-worth is authentically attached to the core qualities of who we are. And the best thing?? It can NEVER be taken away from us, no matter what. I've never felt more determined to take the best care of me than I do right now. And taking the best care will ultimately result in a healthy body weight once again. I didn't plan my food very well today, that's for sure. I ate well, don't get me wrong--but I ending up skipping lunch, had an early dinner and found I had 524 calories remaining afterward. Then I was asked by a friend to be the designated driver for their wedding party, and I accepted the responsibility--not eating another thing until I returned home after midnight. My #lastfoodofday was a turkey burger with onion, swiss and a Laughing Cow French Onion wedge and I still ended the day with 151 calories unclaimed in the Calorie Bank and Trust account. I'll plan better tomorrow! It was a great day for many reasons. I got up and caught up on a few emails, read some other blogs, took care of some business at the bank and post office, then went into work to catch up on a few things before heading to the YMCA for an amazing workout on the trusty elliptical. I'm telling you--since this whole identity-self worth thing hit on Thursday night, I haven't been the same person. My friend whom I was driving tonight asked me, "Have you been drinking?" No!! Is the change in me that noticeable?? Perhaps I'm a little giddy. And you know why? It's because I've spent my entire life not understanding how to genuinely love myself and just be okay. And please don't misunderstand, I'm not saying I've figured it all out, but I'm exploring areas and things long forgotten, things sacrificed by the pursuit of fulfillment in all the wrong places. Now I'm contemplating a very exciting question: What can I accomplish now that my strongest embrace is around the things that matter most? Redefining the list of things that make me worthy of all things good is like giving myself permission to soar, no matter the direction of the wind. As I continue my journey back to a healthier body weight and beyond, I've put into place some high accountability tools. I've committed to tweeting a picture, description and calorie count of anything and everything I eat. And I'm keeping the Calorie Bank up to date with a MyFitnessPal food and exercise log. Join me on Twitter, I'm @SeanAAnderson And SeanAAnderson on MyFitnessPal. Last night's blog was good for me. I couldn't get it off my mind today. And every time I thought about the exploration of it, I smiled. It felt phenomenal to process, understand and write. It was a breakthrough in my thinking and I can tell, this will have a profound effect on me for the rest of my life. I can't look at myself the same anymore, not even if I tried. This was a long day. I just finished dinner and it's 11:26pm. My day started before 6am. I was broadcasting from the Titan FC 28 event held at a casino tonight. I've never thrown a punch in my entire life, so naturally me attending and broadcasting from an event like this took a considerable amount of forced enthusiasm. Plenty of people LOVE the MMA fights and to that I say, what's wrong with those people? I'm kidding. But seriously, I become very uncomfortable watching people beat each other senseless. I feel for the guy against the mat, being held down and pounded. If I'm rooting for anyone, it's that guy. Get up, breathe--you can do it--survive!!! I didn't stay for all of it--the main event part of it. Just not my thing, I suppose. I did get to interview Johhny Hendricks, the UFC Welterweight Champion of The World!! He was much smaller than I imagined, but solid. And he was as nice as he could be. I know next to nothing about his sport, so I kept the questions generic and easy. "Johhny, after being a four year All-American wrestler in college (yes, I did some homework), you transitioned to MMA and now you're a world champion. How do you make it look so easy?" In case you're keeping score--I stated three facts and followed with a softball question...he hit it out of the park. Had I done a little more homework i would have asked him about training or defending his title... Nah...I'm not a radio MMA reporter, I'm a morning radio personality. I'll leave the real interviews to those involved in the sports world. I wanted to ask him if we could take a selfie together with him holding his fist to my face but I decided that would be a tad bit unprofessional. Besides, as friendly as he was, there's still a seriousness about him, an intensity and I didn't want to risk upsetting him--I mean, if you're going to upset someone, a professional fighter isn't the best choice. The VIP meet and greet with Johhny was stocked with plenty of food and drink. And I failed to plan properly, meaning I didn't bring any snack baggies of fruit. I didn't want to eat dinner there. I wanted dinner on my own terms, so I made the decision to eat a few pieces of the fruit from the big spread and patiently wait until I could get home and cook something nice. In this same scenario, time and time again--I've forfeited control and just thought, oh well--I'm here, I'm hungry--let's see what we can do. But I feel different now. It's hard to explain--but it's thrilling, I'll tell you that!! To be exposed to a big spread of food--free food at that--and simply grab a few pieces of fruit, waiting until later, I'm patting myself on the back and feeling awesome. I didn't finish in time to get into the YMCA and when I left the venue it was 48 degrees with a steady cold rain. So, I've decided to forego the workout tonight and be okay with it. I'll be hitting the Y again tomorrow. I stopped at Walgreen's on the way home to pick up some trash bags. I cannot count the number of times over the last year and a half that I've walked in that store and walked out with a whole bunch of binge calories. Cereal, ice cream, cookies and milk, chips, candy bars--and sometimes more than one from this list...and all of it was there tonight. And so was I. I left Walgreen's with trash bags. That's it. And that's huge for me. I'm looking forward to a wonderful weekend. I hope you are too! May 15th, 2014 An Answer To The Unspoken, Silent Plea: Why Do I Feel This Way? I failed to mention my brush with law enforcement last evening. I was in too much of a hurry to get to the YMCA. I was in a 40 mph zone and when it switched to a 30 mph zone, I kept going 37 mph. The officer asked for my license and insurance verification and much to my surprise, both had expired 04/30/2014. I had insurance, of course, I just didn't have a current verification. I received a warning for the speeding and two citations for the other offenses. The officer told me to present proof of both, and the tickets would be dismissed. This meant two stops this morning, one to the insurance office and one to the tag agency where they issue the new drivers license. Both citations were dismissed. I have the last three licenses and each picture shows a different stage of my transformation. The last was taken at 258 pounds. It was the first time my license reflected the truth about my weight. 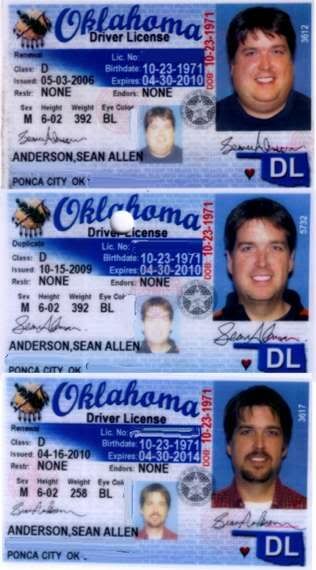 The weights on my licenses have always showed a number between 50 and 108 pounds less than reality. But not the last one--and I was so proud of that license because of what it represented. I was proud and confident in it and the weight displayed was accurate for a change. I didn't want to part with it today. Luckily, I didn't have to. The new photo shows my considerable weight gain and since I unintentionally forgot to remind them--they left the weight as 258. Oh well. As I once again achieve an optimal healthy weight, I'll have it redone to reflect the changes. Remember this photo? I had a co-worker put this together for me in 2010. She is much more computer savvy than I am. She knew how to get rid of the critical information. I don't know how or I would add the new picture to these. The more I thought about all of the energy I was giving this new license thing, specifically the required photo, the more I started thinking on a deeper level. I felt a slight twinge of shame, regret and embarrassment at the tag office today. It's lessened considerably since getting firmly back on track. But it's still there. Then, I had an epiphany on the way to the YMCA tonight. Why in the world should I ever allow the shape of my face or the size of my pants determine my self worth? This isn't how I treat others, so why would I treat me that way? And then I started thinking about the differences between how I felt about me at 505 and how I felt at 230 and that's when I experienced a breakthrough in my thinking. In that moment I imagined the scales of justice. On one side was my love for the non-physical parts (my mind, my sense of humor, my talents, my heart, my natural compassion for others, my ability to communicate, etc.) and the other side of the scale was my love for things physical about me. The personal injustice has been the obvious imbalance and distribution of my love for self. At my heaviest, I had nearly zero love for the physical and what little love I had for the non-physical was small, barely existent and unacknowledged because I was too busy hating the way I looked. At my healthiest weight, I still paid little attention to the non-physical attributes because I was too busy loving the way I looked. Throughout my entire life I've largely ignored the important things that make me who I am. My most intense focus was either hating the way I looked or loving the way I looked. With this narrow minded perspective, the only source of identity and self-worth remaining relied almost exclusively on my appearance. It isn't any wonder why I've limited myself over the years. Even worse is the natural tendency to project this fluctuating self-perspective onto others, as in, if I feel this way about me, surely they do too. When I think about my closest loved ones, I realize their perspective of me is never conditional based on appearance. When I spend time with mom, she doesn't even notice the weight gain, she just sees her son. When I pick up my grandson and he looks at me and smiles, it's an innate understanding that I'm someone who loves him deeply and will protect and care for him no matter what. When I spend time with my daughters, it's clear their love for me isn't placed on a scale, ever. And then I realized: This is what they mean when they say you must love yourself first before you can fully experience and appreciate the love and richness of life. Oh my goodness, I feel like shedding tears just writing these words. If I was confused before, it was very clear now. I'm a great person worthy of love regardless of my size and appearance. I have my mind, sense of humor, talents, a big heart, loads of compassion for others and so very much more. And none of it is diminished with weight gain or increased with weight loss. And my journey will continue toward a healthier weight because I want to live, I want to move easier, I want to experience the freedom a healthy body weight provides. Regardless of how this journey goes, I believe I just discovered one of my greatest personal freedoms of all. All of this was processed over a ten minute period as I drove to my workout tonight, as if by divine placement in my brain, an answer to my unspoken, silent plea, why do I feel this way?? I walked into the YMCA tonight with a confidence I haven't felt in a very long time. I climbed aboard the orange trimmed elliptical and proceeded to have my best personal workout, possibly ever. My stride was longer. Within the mechanics of the machine, I was sprinting. And this energy never subsided. Last night I stopped ten minutes earlier than planned. Tonight, I could have easily done another twenty. May 5th, 2014 What If?